China’s President Xi has succeeded in breaking the power of China’s historic military companies and asserting control over its military. As a result, China now has a better equipped, trained and coherent military force on land, sea, air, space and in cyberspace. 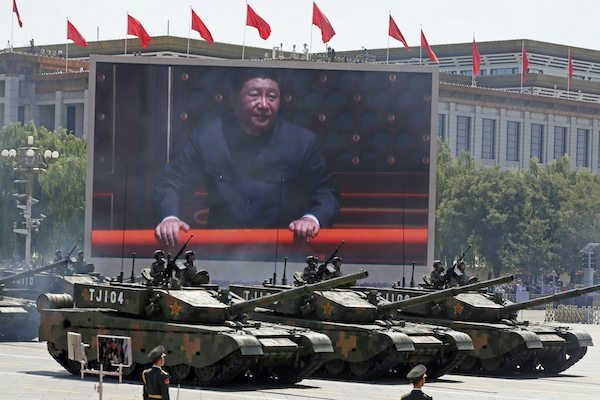 There has been no problem more difficult for modern Chinese political reformers than dealing with the centuries-long entrenched power of the Chinese military. The influence of the Chinese military in the economic affairs of China has been extensive for the last three thousand years. It has always dominated the agricultural sector and, after the death of Mao Tse-tung, it has been the dominant force in Chinese industry and politics. There is a long tradition of warlords in China, especially from 1916 to the late-1930s, when the country was divided among military cliques. This division continued until the fall of the Nationalist government in the mainland China regions of Sichuan, Shanxi, Qinghai, Ningxia, Guangdong, Guangxi, Gansu, Yunnan, and Xinjiang. During this period, a warlord maintained his own troops loyal to him, dominated and controlled the agriculture and mining in his area or region, and acted as the de facto political power in that region. To maintain themselves they often fought with their neighbouring warlords and against any attempt by the Emperor or central government to control them. 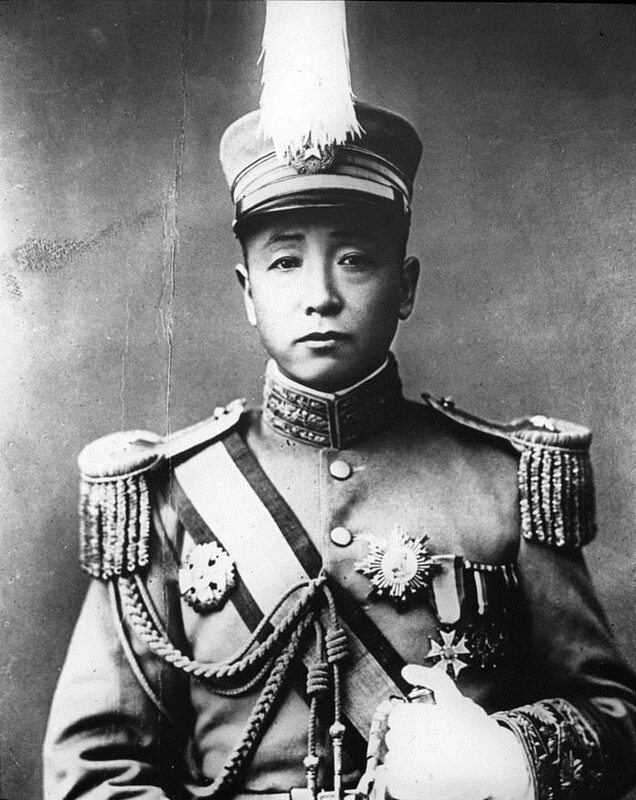 Zhang Zuolin, warlord of Manchuria within the Republic of China (1912–1928). Some of the most notable warlord wars, post—1928, including the Central Plains War, involved nearly a million soldiers. Despite providing a national civil service and a national administrative regime, the central government was uniformly weak and relied on the power and support of these fractious warlords. By the beginning of the 19th century the imperial hold on China had become weakened due to the discovery of China’s wealth by the European colonial powers and the Japanese. They had begun making demands on the ruling emperors and were allowed to impose “unequal treaties” that created foreign concessions in China’s ports. The weakness of the central government structure allowed the rise of regional warlords whose armies fought with each other for territory and plunder and were funded in this by these foreign powers. Qing Dynasty rulers tried to respond by instituting a number of reforms but the foreign powers refused to allow this. After a period of ever-increasing presence of foreign traders, Christian missionaries, foreign troops and British-supplied opium, a violent surge of protest occurred among the Chinese. This included many of the warlords, landowners and the newly urbanised poor. 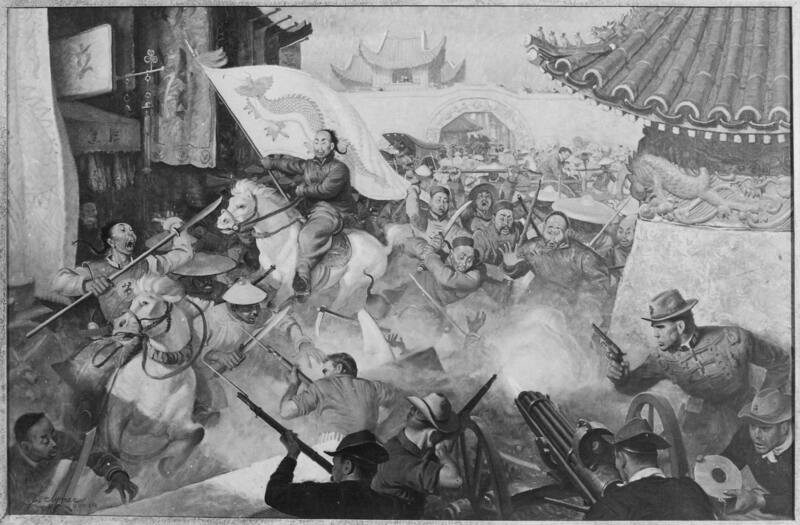 Their rebellion against foreign rule and in support of the Qing reforms led to their capturing Beijing and attacking the foreign legations – the “Boxer Rebellion” (1899 – 1901). Initially they were successful but the imperial powers formed an Eight Nation Alliance (UK, Russia, Japan, France, U.S., Germany, Italy and Austro-Hungary) against the Chinese. 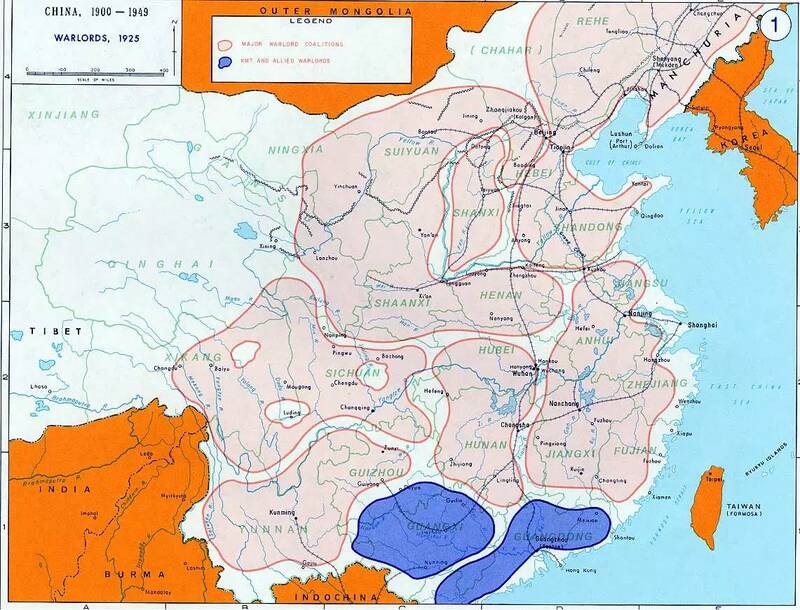 They assembled 50,255 foreign troops (expeditionary forces) plus 100,000 Russian troops to occupy Manchuria. In addition, a portion of the Imperial Forces led by Yuan Shikai’s Division fought with the foreigners against the Imperial troops. 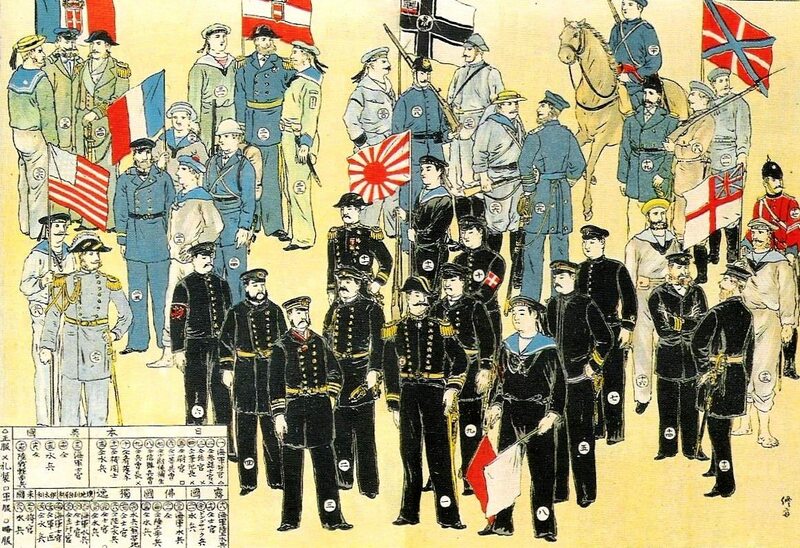 The eight nations with their naval ensigns (l-r) Italy, United States, France, Austro-Hungary, Imperial Japanese Navy, Kaiserliche Marine, Imperial Russian Navy and Royal Navy (Japanese print, 1900). By the summer of 1900, the Imperial troops were defeated, and Beijing was seized. These eight foreign powers would extract further concessions from the weakened Qing government. U.S. Marines fight Boxers outside Beijing, 1900 (Painting by Sergeant John Clymer, 1926). By 1911-12 the Chinese military instigated a series of revolts by reform-minded officers. This led to the Proclamation of Republic of China under Sun Yat-sen and the abdication of the last Qing emperor. Although the Emperor was removed, this change did not lead to democracy in China as no army was so strong as to effect change in more than its own area. Sun Yat-sen attempted to build national institutions but was unable to stand up to the growth of warlordism and the rise of the Communist Party in China after the Russian Revolution of 1917. Communist propaganda poster (“To gain more victory on the road of continual revolution”), with Communist Party leader Mao Tse-tung. The defeat of the Kuomintang leadership of the ex-warlord Chiang Kai-shek in the wake of the Second World War left a ravaged China in the hands of the Chinese Communist Party led by Mao Tse-tung. 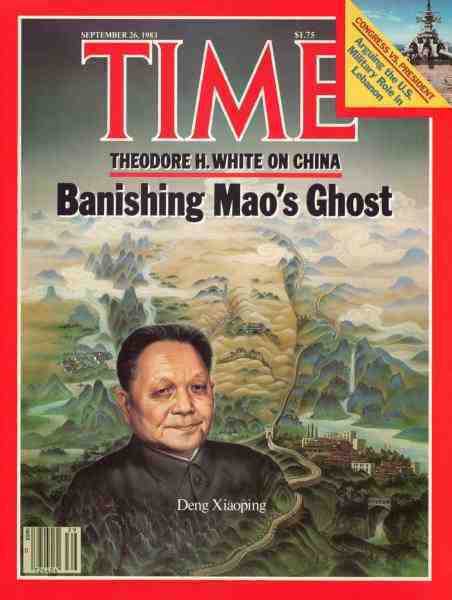 Mao was both the Chairman of the Chinese Communist Party as well as the Chairman of the Central Military Committee. His rule was personal, direct and disastrous. The Great Leap Forward and the Cultural Revolution led to the virtual self-destruction of China. Millions starved to death; many more were exiled or driven away from the cities. Mao was succeeded by Hua Guofeng who attempted to keep a tight control over the power structures of China, including the Central Military Committee. However, his power waned and control was transferred to the reformer Deng Xiaoping, who revolutionised the economy of China. Deng never held office as the head of state or the head of government, but served as the de facto leader of the People’s Republic of China from 1978 to the early 1990s as the leader of the Communist Party of China (CPC). Deng represented the second-generation Chinese leadership and was instrumental in introducing Chinese economic reform, also known as the socialist market economy, and partially opened China to the global market. He is generally credited with pushing China into becoming one of the fastest growing economies in the world and by raising the standard of living. Deng Xiaoping’s ouster of Hua Guofeng was the moment when the market policies of economic reform began. This reform was carried on primarily by the military companies created in the various regions by the armies which controlled them. Under the direct control of the Chinese Communist Party private enterprise was condemned but military-owned businesses began to thrive. It is not difficult to see why the companies owned by the military became the engines of economic growth. The People’s Liberation Army (‘PLA’) controlled the security situation in the country and, most importantly, in the regions. 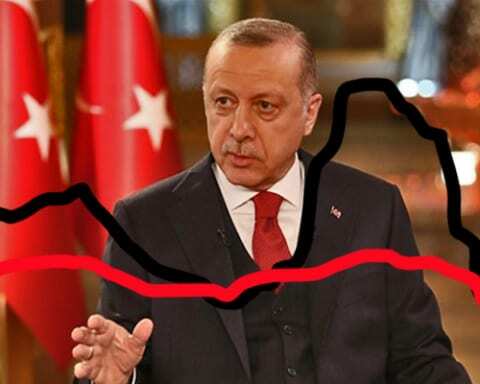 The military issued permits to enter or leave the region; it controlled the communications network in the region; it had the trucks and other transport under its control; and it was charged with maintaining order. It was, in fact, in charge. This was not controlled by one central PLA group but was under the control of the individual army for each region. Some, like the 28th Army and the 39th Army were in economic hotspots and were able to thrive quickly. The Northern Army was quick to exploit its opportunities. 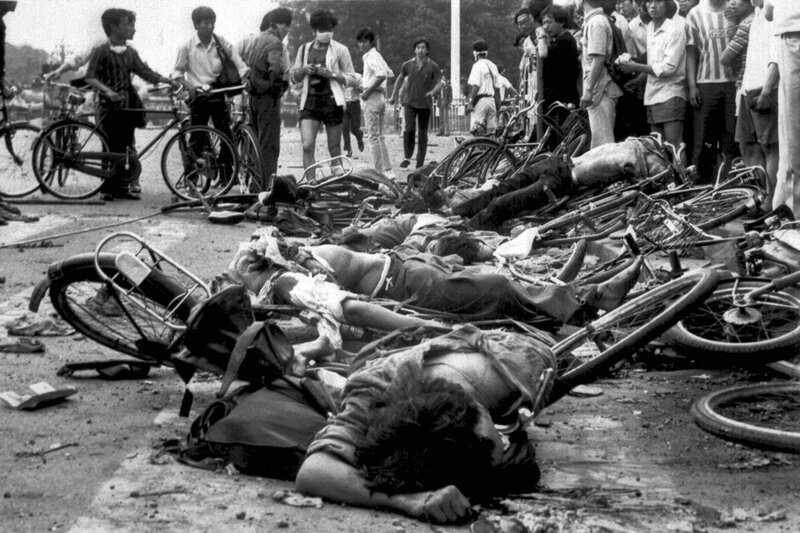 The opportunity arose in the wake of the civil disturbances of the Tiananmen Square uprising, when the Chinese Communist Party, under Li Peng, cracked down on China’s democracy movement, ordering in troops to battle the students. The PLA was ambivalent about this and seven retired senior military officers openly criticized the martial law order imposed by the Beijing government and called for the ouster of Premier Li Peng. In the march towards the capital, at a village five miles southwest of Beijing, soldiers and peasants engaged in a brick-and rock-throwing brawl that injured as many as 40 people. The PLA did its duty but the populace was outraged and the authority of the Communist Party waned throughout the nation. The PLA realised it was free from the controlling hand of the Party and became agents of change; primarily corporate change, encouraged by Deng Xiaoping (retired but active). They already had numerous companies under PLA control manufacturing goods for the defence sector. During Mao Tse-tung’s rule and the era of Sino-Soviet tensions, the military moved many of its factories inland in case of a possible attack on China. Manufacturing purely military products, such as arms, ammunition, as well as electronics, plastics and metals for military applications, these so-called “third-line” factories were built in remote mountain regions, far away from transportation routes and power sources. The factories bought supplies at subsidized costs from other factories, manufactured the weaponry and related products — generally low-tech and low-quality — and then sold them to the military at subsidized prices. After Mao’s death in 1976, the new leadership encouraged the military plants to begin exploring civilian uses for their products and to engage in the broader liberalizing economy. The nimblest managers were free to exploit new markets for their goods. During the early 1980s, the PLA’s share of the national budget declined, spurring it to look to other sources for cash, especially hard currency. The higher organizational levels of the PLA created trading companies like China Xinxing, China Poly and China Songhai to take advantage of the opening of China’s economy to the international market. They formed banks, holding companies and international trading companies like Everbright to market these goods worldwide. Now the PLA runs farms, factories, mines, hotels, brothels, paging and telephone companies and airlines, as well as major trading companies. The number of military-run business exploded during the boom of the late 1980s. The “third line” factories opened branches in the coastal areas, earning increasingly high profits from the manufacture of civilian goods. Even the lowest levels of the PLA set up production units. In fact, the PLA had a largely captive audience of Chinese who had never really had the chance to acquire personal goods produced in China before. In addition to their international arms sales, their production of consumer goods for the domestic market soared. Foreign companies looking for a foothold in China liked partnering with the PLA because of the stability it could offer to any long-term project. Companies with military partners got the added security of knowing that the top “management” of many of the PLA companies are from the ranks of the “princelings,” the children and relatives of senior Chinese Communist Party and military officials. In January 1982, Deng articulated the 16-character “Military-Civilian Combination Policy,” (“military-civilian unity, peacetime-wartime unity, priority for military production, use civilian production to support the military.”) In addition, the Commission of Science, Technology, Industry for National Defence (COSTIND) was also created in 1982 under the Central Military Commission (CMC) and the State Council to integrate the civilian and military sectors of research and development, and production. 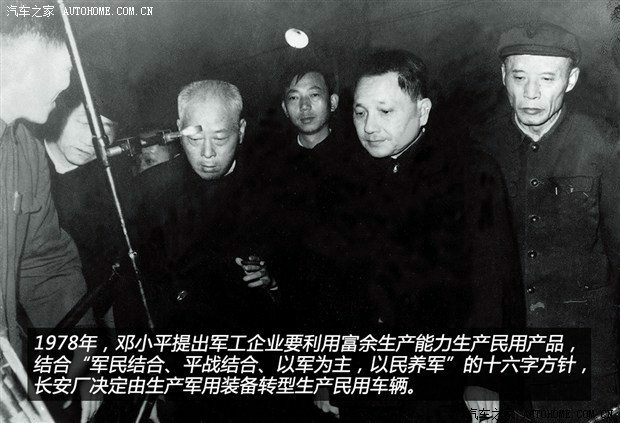 Deng Xiaoping visiting a manufacturing company which transformed from producing military equipment to civilian vehicles. The government first attempted to regulate PLA business activities in 1989 with a series of decrees, among them a prohibition on active military personnel concurrently holding positions at commercial enterprises. The reforms were intended to keep management of PLA enterprises under the control of senior military leaders and prevent lower-ranking officers from becoming involved in the daily functioning of the military companies. In the wake of the national rejection of the Party in 1989 these government strictures fell away. The government tried again in the early 1990s, when the central leadership of the military took steps to coordinate the production of the vast number of military factories by tying the plants together under “group companies.” The groups, acting like conglomerates, were successful in centralizing management and production, running the trading companies and expanding their business operations. 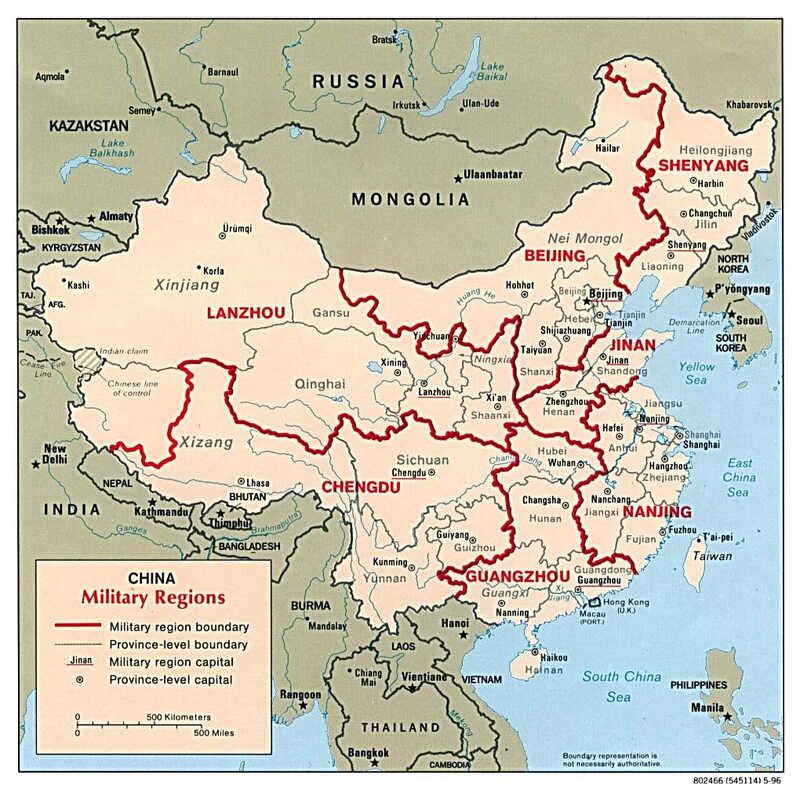 The PLA acted as a state within a state, with its power growing along with Chinese economic expansion. Many of the companies have listed themselves on capital markets in Hong Kong and elsewhere, opened representative offices in overseas markets, solicited foreign companies for joint ventures and partnerships in China and emphasized exports. The so-called ‘red chips’, companies listed on the Hong Kong exchange but which are in fact mainland Chinese firms, are the hottest stocks on the market. Hong Kong is the PLA’s favoured stock exchange because of its loose disclosure guidelines. China Poly Group has two listed companies: Continental Mariner Company Ltd. and Poly Investments Holdings Ltd. Both Continental Mariner and Poly Investments have a large number of subsidiary companies in mainland China, Hong Kong and tax havens like Liberia, the British Virgin Islands and Panama. China Carrie’s listed company in Hong Kong is Hongkong Macau Holdings Ltd. China Carrie also owns HMH China Investments Ltd. on the Toronto Stock Exchange and HMH Gold Mining on the Australian Stock Exchange. 999 Enterprise Group, another company controlled by the PLA General Logistics Department, operates Sanjiu Pharmaceuticals Group, the largest pharmaceuticals manufacturer in China. 999 has listed on the Hong Kong exchange. 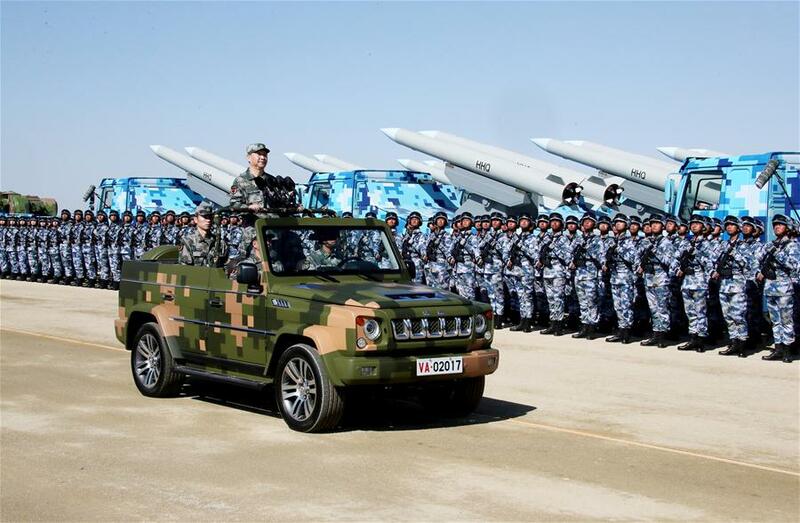 Smaller military enterprises, like the Songliao Automobile Company owned by the PLA Shenyang Military Region, have also listed in the domestic Chinese markets. 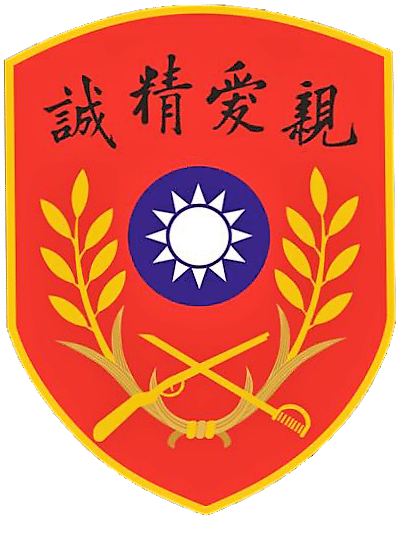 China Poly Group is a commercial arm of the Chinese People’s Liberation Army (PLA) General Staff Department. The PLA General Logistics Department operates China Xinxing. The PLA General Political Department owns and operates China Carrie. And the PLA Navy runs China Songhai. These military companies have tied themselves as well to foreign companies interested in investing in China. Foreign companies looking for a foothold in China liked partnering with the PLA because of the stability it could offer to any long-term project. Companies with military partners got the added security of knowing that the top “management” of many of the PLA companies are from the ranks of the “princelings,” the children and relatives of senior Chinese Communist Party and military officials. These influential princelings ensure that the business operations of the PLA will have the government connections that are so important in China’s corrupt system. In the case of China Poly, chair Wang Jun and president He Ping act as brokers between the government and the military. Wang Jun is the eldest son of the late Vice-President Wang Zhen. He Ping is the son-in-law of the late Deng Xiaoping. Wang Jun’s brother, Wang Bing, is the chair of the PLA Navy Helicopter Company. China Carrie’s president is Ye Dunning, the second son of late PLA Marshal Ye Jining. The power of these princelings has been a major impediment to the opening of Chinese domestic industries. 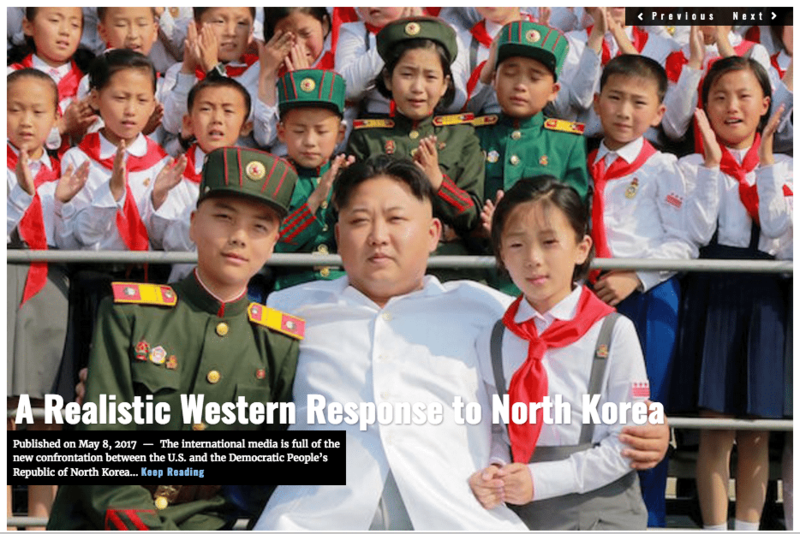 They formed a powerful faction in the Central Military Council, as opposed to the institutions of the Communist party. The PLA has remained strong since the earlier days of the warlords. Their power lay in the weakness of the central government. The various imperial dynasties were limited in their ability to rule such a vast expanse of territory as China and domestic political groups were slow to form. With the fall of the imperial system the Chinese labour movement began to organise. In this they were assisted by the agents of the Communist International (‘Comintern’) which had formed in Russia after the 1917 revolution. The Communist Party of China drew its strength from the urban working class in such large cities as Shanghai and Canton. In these cities, there was an urban proletariat which had settled permanently and worked in the ports, transport hubs, construction and an increasing number of administrative jobs. Sun Yat-sen and his troops played an instrumental role in the overthrow of the Qing Dynasty. After the success of the Double Ten Revolution he became the first president of the Provisional Republic of China, in 1912 and then founded the Kuomintang, serving as its first leader. He was succeeded by Chiang Kai-Shek, who led the Kuomintang into a close relationship with the Bolsheviks. 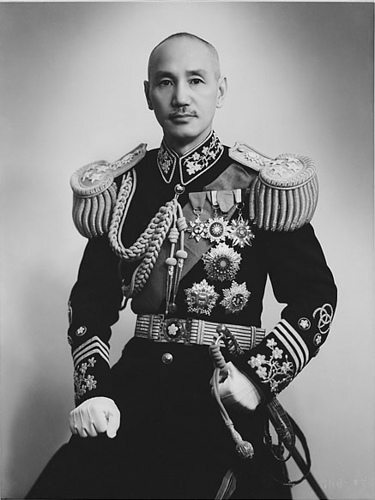 Chiang Kai-Shek, President of the Republic of China in mainland between 1928 and 1949. It was a little ironic that the first trade union bodies to fall under the almost complete control of the political forces were the urban unions of China, especially in Shanghai. In China, after the republican revolution of 1911, trade unions began to form among the urban masses of China’s large cities. With the formation of the Comintern, numerous unionists were sent to China to help strengthen the nascent Chinese communist unions and parties. Mikhail Borodin’s famous mission was only one of many Comintern missions. Nonetheless, power remained firmly in the hands of the local warlords whose min t’uan (private armies) controlled much of the rural areas. By far the most important development emerged in 1923 when the workers, students and peasants began to form national parties. Among the first was the Kuomintang, or Nationalist Party. The other major party was the Kung Ch’antang, the Communist Party. Interestingly the Kuomintang found a close ally in the communist party of the Soviet Union which sent down instructors and advisers to shape the Kuomintang into a disciplined Bolshevik party. No sooner had the party formed and become organised when the Soviets demanded that the Kung Ch’antang merge itself into the Kuomintang. In the meantime, the Kuomintang became a model in miniature of the Russian Bolshevik party. The Soviets sent advisers to instil communism in the military forces and set up the Whampoa Military Academy. The Soviets shipped in arms and instructors to bolster the Kuomintang forces. The Kung Ch’antang remained a left faction within Kuomintang and worked to strengthen the Kuomintang on Moscow’s orders. The Chinese communists were successful in recruiting the urban workers of Canton and Shanghai and were able to set up communist-led peasant organisations in Hunan. They built strong unions among the railroad workers and miners in Hunan and, through their control over the Independent Division of the Fourth Army in Hunan, were able to control the industrialised areas east of Changsha. The leadership of the Kuomintang devolved on the director of the Whampoa Military Academy; the hero of the northern campaign, Chiang Kai-shek. Having won control of Canton he began a march on Shanghai. In support of the Kuomintang the workers in the communist unions of Shanghai began a series of major strikes. At the height of this demonstration more than half a million workers went on strike in Shanghai, backed by an armed workers’ militia of more than five thousand. On 26 March 1927 Chiang Kai-shek marched into Shanghai, welcomed by the striking workers as their liberator. Chiang had barely been in the city for a few days when he contacted the leaders of the compradors and the notorious Green Gang to make a deal with them. Allied with these forces, Chiang began a purge of all the communists, especially the unionists. On 12 April 1927, he and the local gangs turned their forces on the communists in the unions. More than five thousand communists lost their lives. 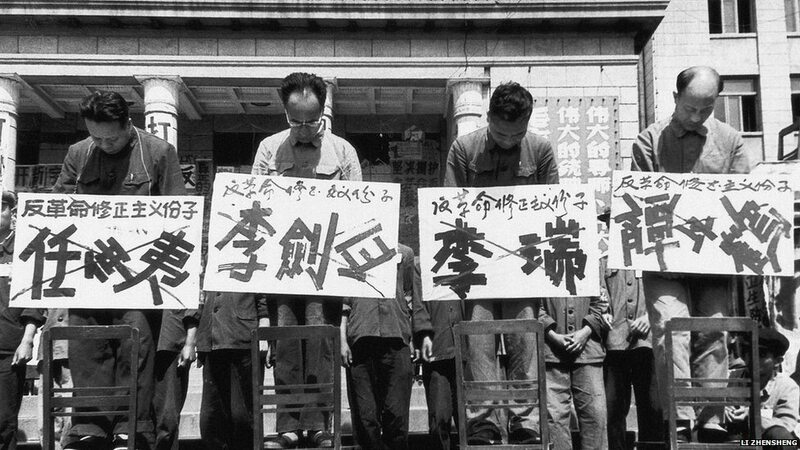 When the strikes ended in May, communist control had been wrenched from the unions by the Kuomintang. A brief attempt at an urban uprising based on the unions in the 1930s was ruthlessly put down by the Kuomintang. The Soviets had succeeded in creating a Kuomintang which had devoured the local communist party. It was Trotsky, in fact, who had warned of the dangers involved in making the communists join the Kuomintang. He wrote that ‘the policy of a shackled Communist Party serving as a recruiting agent to bring the workers into the Kuomintang is preparation for the successful establishment of a Fascist dictatorship in China”. He was not wrong. The Kuomintang set about obliterating the communists, driving them from the cities to their stronghold in Hunan. The Chinese communists, led by the son of a wealthy Hunanese peasant, Mao Tse-tung, adopted these lessons to the communist struggle in China. He decreed that the peasantry (not the workers) should form the basis of the revolution. Only after the peasant revolution would there be a need for control of the urban masses. In addition to making a virtue of necessity, this line abandoned the unions in the cities to the less than tender mercies of the Kuomintang. During the civil war with the Kuomintang numerous workers’ units joined Mao’s Hunan army and participated in the Nanchang Uprising. The largest union support came from the iron miners of Hanyehping in Wuhan. In fact, the First Red Army was largely composed of workers. When these troops were destroyed in battle by the forces of the Kuomintang the first generation of trade unionists in China was virtually eliminated. The 1937 start to the war with the Japanese finished off most of the others; even though the Kuomintang and the Communists cooperated against the Japanese invasion. 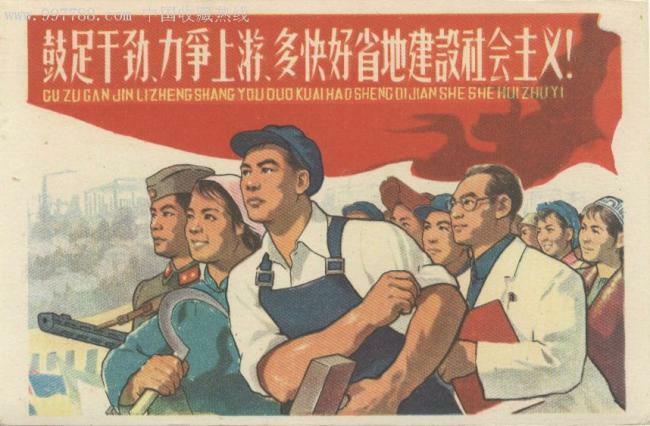 Slogan of Great Leap Forward: “Gather up all forces, and strive to build socialism with greater, faster, better, and more economical results.” It raised unrealistically high production goals. The Great Leap Forward was a catastrophe on a monumental scale. Estimates of the toll of the program range from twenty to forty-five million Chinese deaths, most of whom died of starvation. After the Second World War and the rise of the Chinese Communist Party to power, the Chinese peasantry formed into villages in which peasants owned their small-holdings. The Communists imposed a “hukou” system of internal passports in 1956 which restricted movements within the country. Then they ordered that these agricultural properties be collectivised. Not only did agricultural productivity decline but strange schemes, like backyard steel mills, were enforced and encouraged which further diverted rural labour from farming. Those who opposed were labelled “rightists” and punished. It was an unqualified disaster. Although the harvest of 1958 was very productive the diversion of labour to the alternative projects like steel-making meant that a great deal of the harvest was never gathered from the fields. Then a giant storm of locusts attacked the food stock and grain stores. The Great Sparrow Campaign of the Communists had destroyed the birds which were the predators of the locusts so the locusts destroyed the crops without control or impediment. This was followed soon after by the Cultural Revolution where young activists purged the dangerous intellectuals and dissidents from the cities and sent them to “re-education camps” in the provinces. A new system was introduced for the use of Chinese labour, the Laogai which means “reform through labour”. This is the system of large prison camps where non-criminals were sent to be re-educated through hard labour. It is estimated that in the last fifty years, more than fifty million people have been sent to laogai camps. Intellectuals and dissidents were considered anti-revolutionists, and were punished by being publicly humiliated and sent to “re-education camps”. Their names were written on the boards around their necks right under the crimes they were accused of “anti-revolutionary revisionist”. As the economic situation in China improved with the rise of the military-industrial complexes and the rehabilitation of the Chinese Communist Party after Tiananmen Square led to a more liberal line in domestic political conversations, it became clear that the system still required major changes. The growth of the power, influence and money of the military corporations engendered the rise of institutional corruption. Although there were party and governmental institutions at every level in China they received only a relatively small sum to maintain them. Party officials were tempted to turn to their local military leaders for additional funds and offered support in return. There was a symbiotic relationship between local officials and the local military which granted licenses, permits, property easements, school places, etc. in return for cash. This level of corruption was a tremendous challenge to a genuinely reformist policy, particularly to the programs of President Xi Jinping. By the mid-1990s, the so-called PLA Inc. included over twenty thousand companies in everything from agribusiness to electronics to tourism to arms exports. The 1989-1990 reforms had only a marginal effect. The Party had a slightly diminished control of these companies. With the rise to power of President Xi Jinping in 2012, the party began to reassert control over the military and its companies. In addition to his role as Chairman of the Communist Party, Xi took over the leadership of the Central Military Council (‘CMC’) the Party’s control organisation in charge of the military. He used his position to dramatically reduce the number of soldiers and reorganised the military structures. Most importantly, Xi embarked upon a strict anti-corruption campaign. President Xi concentrated on the “rule of law” within China. 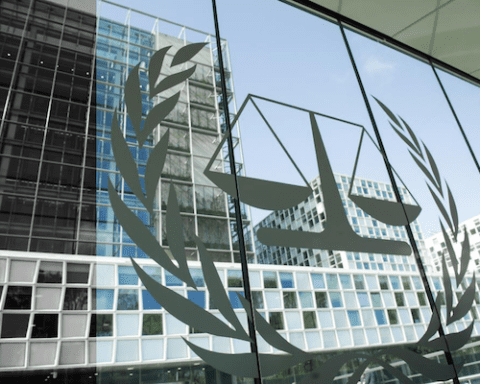 An important part of the “rule of law“ was the eradication or, at least suppression of corruption. Since the start of his anti-corruption drive in November 2012, more than forty high-level officials have been investigated and shamed. These officials include current and former municipal and provincial party secretaries and vice governors, senior government officials, and executives at state-owned enterprises. 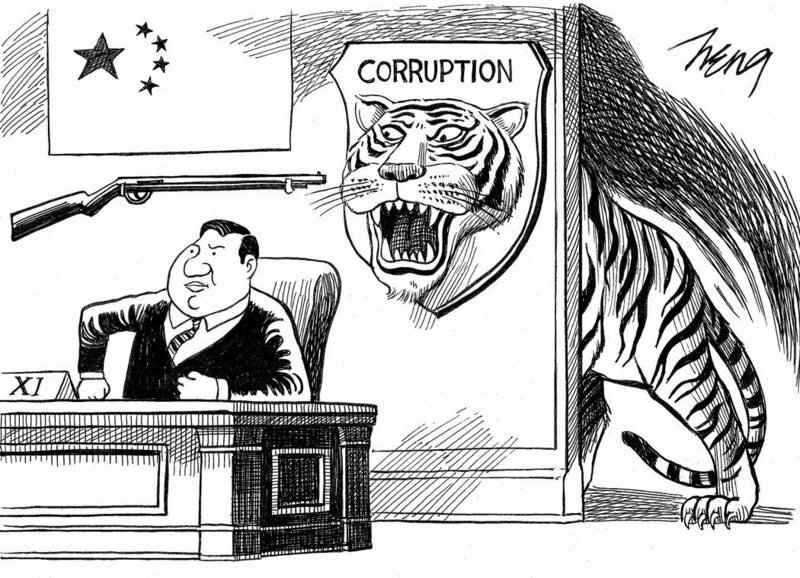 President Xi Jinping’s campaign against corruption (Credit Heng). On November 15, 2012, the Chinese Communist Party released “A Decision on Major Issues Concerning Comprehensive and Far-Reaching Reforms,” a document detailing the party’s Third Plenum (one of seven major sessions held by the Central Committee of each Congress to discuss the affairs of the party) reform plan. Accompanying the release, Xi wrote a letter highlighting eleven key features of the plan, generally viewed as the party’s priorities. The biggest surprise among the announcements was the prominent position given to State-Owned Companies (‘SOE’) reform. The eleven key features of the plan are: a new role for the government and market-driven resource allocation; SOE reform; fiscal reform; integrated rural-urban development (land reform being the key); democratic consultation; judiciary reform; anti-corruption; social media and internet management; a new State Security Committee; environmental protection (assigning custodian rights for natural resources to responsible parties being the key); and a new small leading group to coordinate reforms. President Xi was seen as an unlikely leader of the Party or as a reformer of the economy at the time of his accession to power as he had no apparent political base supporting him. He was never viewed as part of either the conservative or reformist factions of the Party but wavered around a broadly centrist stance. Perhaps this is due to his background and his experience. Unlike his predecessors in the office, Xi has had a prolonged military experience and is a “princeling” of the military establishment. After graduating from Tsinghua University in 1979, Xi’s father was able to get him a job as a secretary to the Central Military Committee, the nerve-centre of the People’s Liberation Army (‘PLA’). His father was Xi Zhongxun, a former vice-premier and a crony of then defence minister General Geng Biao. President Xi’s wife, Peng Liyuan, a popular singer with the PLA Song and Dance Troupe, has the rank of major-general. Xi is known to be on good terms with the disproportionately large number of princelings who have since the early 2000s risen to the post of major-general or above. These “military princelings”, who were recently made full generals with high military ranks included Political Commissar of the Academy of Military Sciences Liu Yuan, Political Commissar of the Second Artillery Corps, Zhang Haiyang, and the Vice-Chief of the General Staff Ma Xiaotian. Xi understands the difficulties confronting a reformer in China. His father was a revolutionary leader of the first generation of Great March Chinese Communists and was deputy premier to Chou En Lai in the late 1950s. In 1962, he was purged from any leadership posts by being associated with an ‘anti- party’ clique. Xi Zhongxun was forced to undergo public self-criticism and in 1965 was demoted to the position of a deputy manager of a tractor factory in Luoyang. Things were worse for him during the Cultural Revolution and he spent time in and out of prison. 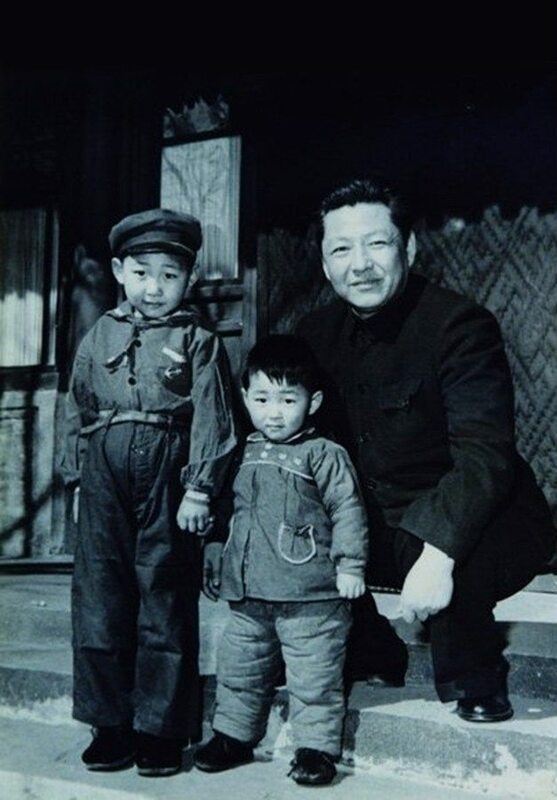 Five-year-old Xi Jinping (left) with Xi Yuanping (younger brother, center, zh:習遠平)), and Xi Zhongxun (father, right, zh: 習仲勲)) in 1958. After the Cultural Revolution, he was rehabilitated and put in charge of the Guangdong Military Region. There he pioneered special economic zones with their own economic and trade opportunities, like Shenzhen. In 1982, he was back in the Politburo until his retirement in 1988. He continued to support economic reform and supported the 38th Army Commander Xu Qianxian when he refused to follow orders to lead his troops into Beijing on the eve of the June Fourth Tiananmen Square Massacre. As Xi’s father was purged from his offices and imprisoned, Xi himself was rusticated and moved out of Beijing to Yanchuan County, Shaanxi until his father was reinstated and rehabilitated in the party. When Xi Zhongxun fell afoul of Mao Tse-tung in 1962, his family was consigned to manual labour in Languishes village, a ramshackle town in northern Shaanxi province. Xi Jinping spent seven years in Liangjiahe under the same conditions as his neighbours — he lived in a cave home, subsisted on rice gruel, and hauled buckets of water from a nearby well. President Xi’s unique origin story and familiarity with previous reform efforts, has made him well suited for the task at hand. His task was to modernise the essential national military, and the political spectrum that it represents. After the rehabilitation of his father into the Party and back into the top rank of the Chinese Communist Party (“CPC”), Xi began his own rise in the the leadership of the Chinese Communist Party. He maintained his position as a “princeling” with the support of the military, but he also supported the reformers in the party and their efforts to open trade zones, like the Shenzen project introduced by his father. He was ideally placed to bridge the gap between the two wings of the party and pursued his reforms and gained popularity by using a very confrontational policy of fighting corruption at all levels. 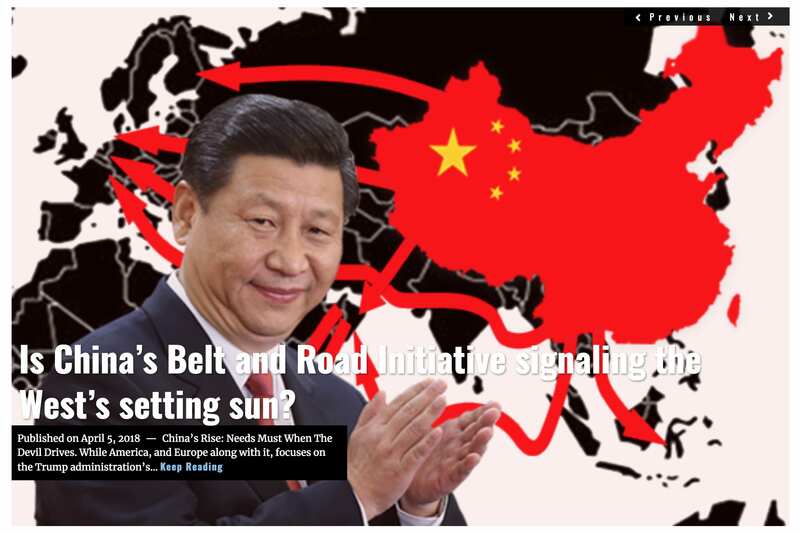 Keeping these two factions together has been the role of President Xi Jinping, as a princeling himself, but with irreproachable reformist instincts. 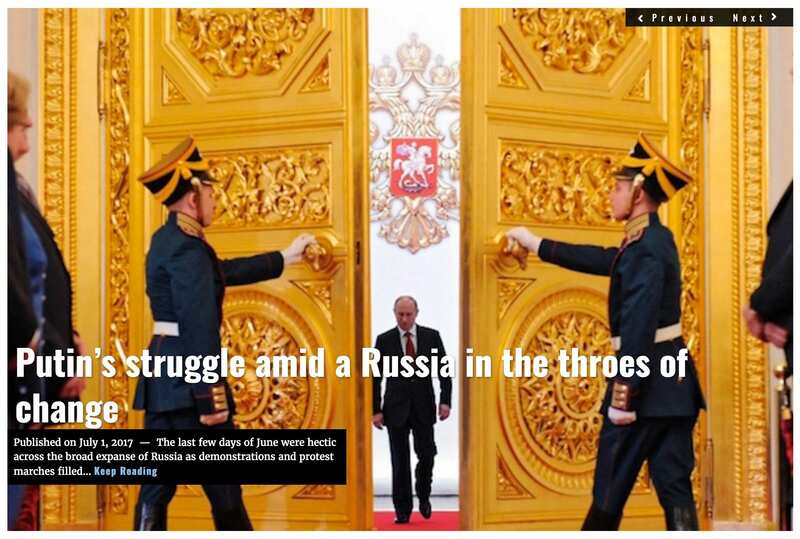 Perhaps his greatest success has been the relentless purging of the PLA of corrupt leaders. Starting in 2012 Xi shook up the structure of the PLA and the CMC. He eventually netted two of the biggest fish in that pond. In January 2015 Xu Caihou, 71, a former vice-chairman of the Central Military Commission and a member of the powerful Politburo, confessed to taking “massive” bribes in exchange for assisting in promotions. He was found guilty and expelled from the party. His death from bladder cancer interrupted his trial on criminal charges. 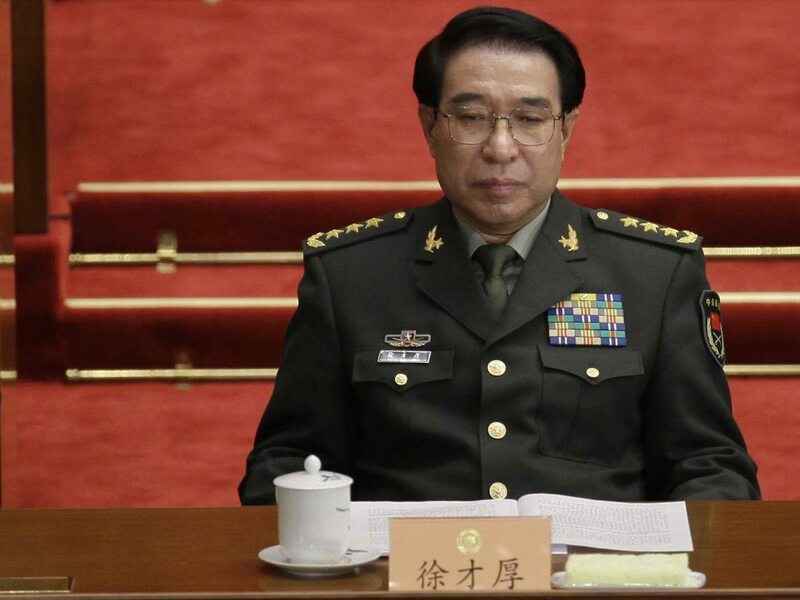 In April 2016, Xi Jinping arrested and expelled from the party China’s top general Guo Boxiong for massive corruption (along with members of his family). The man who ran the world’s largest army was charged with accepting $12.3 million in bribes. Guo was also charged with taking advantage of his position to aid the promotion and relocation of other people. He “confessed” to his wrongdoings. Guo had been the military chief of the People’s Liberation Army and a former CMC vice-chairman. In his ten years at the top Guo had promoted many of the PLA leading figures and they were put on notice by his arrest. The result of this attack on corruption changed the balance between the military and the party leadership. The PLA was presented with the option of allowing many of the major military-industrial companies to morph into state-owned enterprises in return for a proper funding and reorganisation of China’s military. The PLA chose to return to its more military pursuits and leave much of the business to the state and Party leadership. In return, the PLA got new equipment, a reorganised structure and a more focussed program. 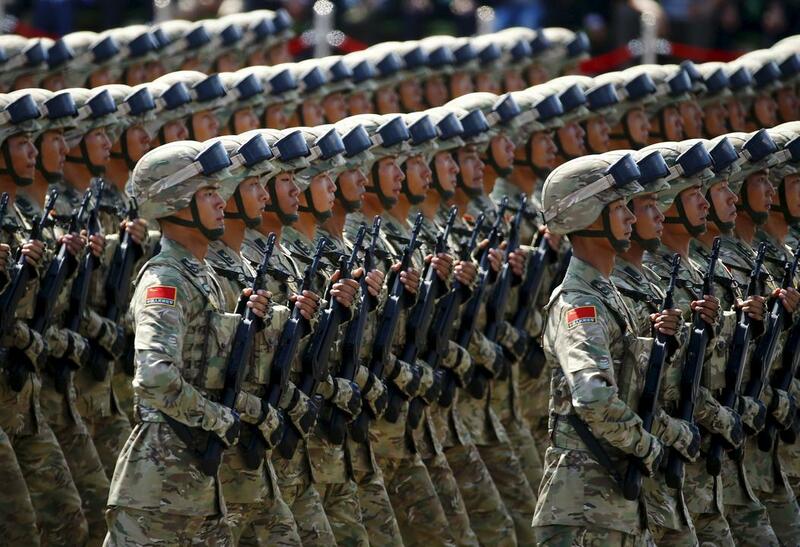 For PLA’s 90th birthday, Chinese President Xi Jinping reviewed parade in field for first time. In January 2016 China announced that it would adopt a radical plan to turn the PLA into a modern fighting force. The CMC stated that there would be a “breakthrough” in the overhaul by 2020, moving away from an army-centric system towards a Western-style joint command in which the army, navy and airforce are equally represented. This overhaul of the PLA would phase out its Soviet-style command structures in favour of a US-style model. The seven military command regions are likely to be consolidated into four to help transform the world’s biggest army into a nimble, modern force. Xi said on September 3 the PLA would shed 300,000 troops, leaving it with two million personnel; 170,000 officials would be among the cuts. seven military command regions. A disciplinary commission would be created within the CMC to tackle corruption, the statement said, adding that inspectors would be sent to every level of the military to ensure strict discipline. The PLA’s nerve centre, the so-called four headquarters (General Staff, General Political Department, General Logistics Department and General Armaments Department) will be dissolved, with only the General Staff remaining. Functions of the other three departments would merge into the General Staff and Ministry of National Defence. In their place would be four new headquarters for the army, navy, air force and a newly created national guard, which would in turn come under the joint command of the Central Military Commission. The army, currently split into seven military command areas, would be split into just four zones: Northeast, Northwest, Southeast and Southwest. The national guard would replace the armed police, taking care of domestic security, disaster relief and anti-terrorism. The CMC will be empowered to have supreme authority over both administration and command of the PLA. 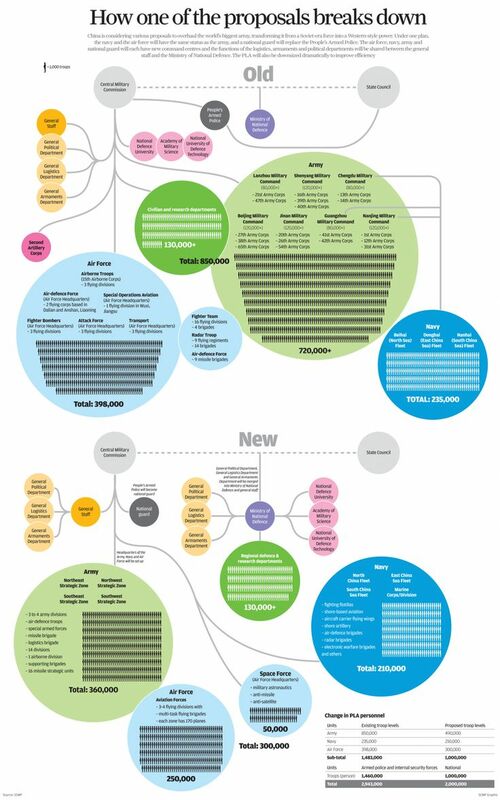 The South China Morning Post published an infographic which explains the nub of the plan. One of the key aspects of the reorganisation is the plan for a modern, effective, blue-water navy. A great deal of the military resources is being directed to establishing a strong presence in the South China Sea. Concomitant with the professionalisation of the Chinese military in the restructuring has been an agreement to turn the companies into private (that is partially state-owned) enterprises. Hungai (混改), or mixed-ownership reform (MOR), is the vehicle for reaching this goal. The world’s second-largest spender on national defence, China is advancing reforms in its defence state-owned enterprises (SOEs). Xi Jinping, as commander-in-chief, has long been vocal about deepening defence industry reform, a sentiment shared by his colleagues on the Central Military Commission (CMC). In 2015, General Xu Liliang, vice chairman of the CMC, “called for China to develop a military-industrial complex like the one in the U.S.”—where the private sector and the invisible hand assume the leading role. In 2016, China had a defence budget of $146.6 billion, and the output of its defence industry was estimated to be around $362 billion. Yet despite the astronomical figures, the Chinese state-owned defence industry has many underlying challenges common to corporations of its type. (Wholly or partially state-owned European defence companies share strikingly similar problems). With soft budget constraints and shielded from competition, it is not a surprise that inefficiency, lack of innovation in certain areas, and mounting debt are prevalent among defence SOEs. MOR hopes to remedy these problems by drawing in funds, expertise, and methods of operation from the non-public sector. 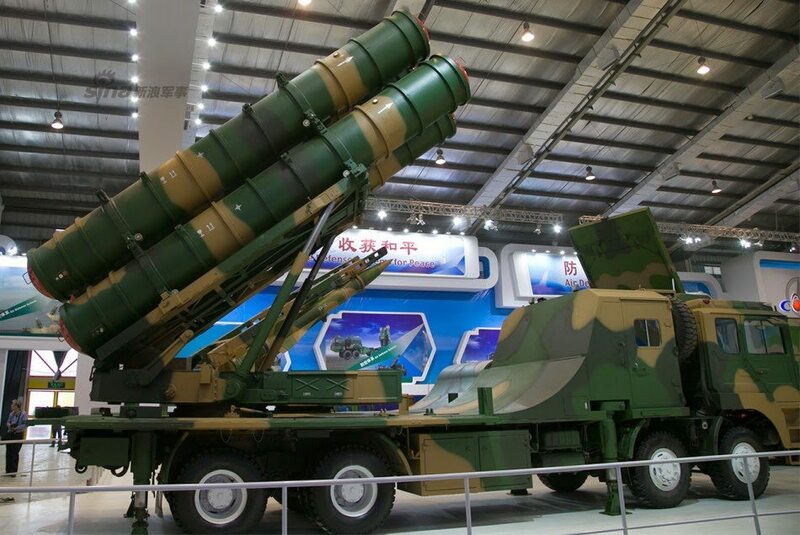 FK-3 SAM displayed at China International Aviation & Aerospace Exhibition 2014. Despite the early successes there is still a gulf between the defence sector and the planners of the central economy. 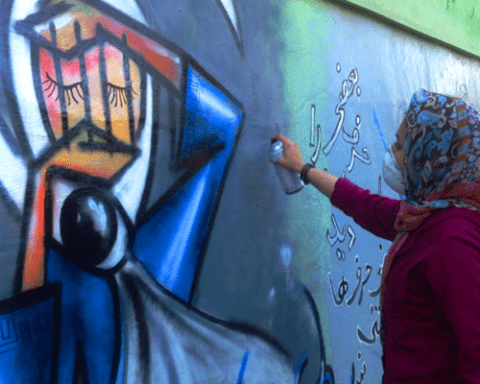 However, the contradiction between the state-owned and non-public sectors remains, as the former still mistrusts the latter, and the latter wishes for more leverage in dealing with the former. The defence industry can always make an argument against market-oriented reforms in the name of national security. The chasm between the state-owned and non-public sectors is deep, and it will take time before defence executives are willing to share power with new owners based on fairness and mutual respect. The defence industry is still commanded by the “plan” and the state will not surrender its leadership position since defence is considered a “strategic sector”. The enormous power the state has in shaping corporate governance means non-state shareholders will always be at a disadvantage. Despite renewed promises to delimit the power of Party organs, shareholders, the board of directors, the supervisory board, and management, the path towards a satisfactory balance of powers between the two is not without impediments. In 2015, General Xu Liliang, vice chairman of the CMC, “called for China to develop a military-industrial complex like the one in the U.S.”—where the private sector and the invisible hand assume the leading role. Despite being a one-party state, China does have a political cycle, which turns every five years. 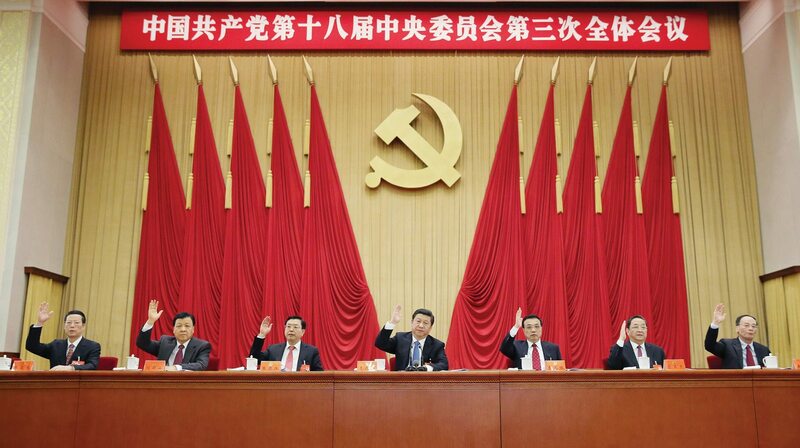 The event that marks the turning of the cycle is the Communist Party of China’s (CPC) Party Congress. The CPC will hold its 19th Party Congress in the autumn of this year, making it one of the key political events to watch. At the 18th Party Congress four years ago, the leadership of Xi Jinping and Li Keqiang was established and an ambitious plan to reform the economy was introduced; the upcoming 19th Congress will carry a similar weight. The new 19th Party Congress is likely to support President Xi’s drive towards modernisation and reform. However, five of the seven members of the Politburo Standing Committee – all except President Xi and Li Keqiang, the prime minister – are expected to step down after reaching the mandatory retirement age of 68 at next year’s Party Congress. This may allow into the leadership some members who appear to wish to proceed more slowly with the relaxation of controls over the economy and the privatisation of the defence industry. President Xi has been trying to bend the rule about compulsory retirement and has sought to keep Wang Qishan (his closest ally) in office after the 19th Congress. Whatever the outcome, President Xi has succeeded in breaking the power of the Chinese military companies and asserting control over the military by the party and the CMC. As a result, China has a better equipped, trained and coherent military force on land, on the seas, in the air, in space and in cyberspace.